Occasionally a facility experiences a short term need for a department manager due to a Leave of Absence or as the result of a director separation. Often the existing supervisory and management team can maintain the status quo until the director returns. However, if the vacancy is going to be prolonged, or of an unknown period of time, a short-term interim director to fill the position may be needed. At dk Foodservice Solutions, LLC I can help fill the gap, as a Certified Dietitian and Registered Dietitian with years of experience as Foodservice Directors in acute care and senior living settings. Although the specific scope of service would depend on your needs, our primary focus would be to support the existing staff and services to maintain your current programs. Our area of expertise is in department management, system processes and financial control. We do not provide therapeutic clinical nutrition services. If your need is for clinical nutrition support, we can refer you to qualified Consulting Dietitians in the area. Our company mission is to provide support for today’s foodservice director focusing on the operations performance. We work with Administrators and Foodservice Directors to build stronger relationships, which builds a stronger foodservice manager, which leads to a stronger department. 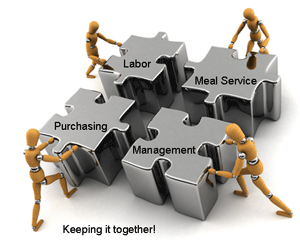 We want to develop the manager into a leader in their organization and the foodservice industry. For information regarding Interim Management Support please contact us.